It’s never a good thing when you hear that Restaurant Impossible (or any of its counterparts on other networks) is coming to town. To even be eligible to be on a show like that, your restaurant has to be on the verge of failure, and the owners up against the ropes. Being on a show like that literally is one of the last grasps of the desperate. So which local, failing, and desperate restaurant was Restaurant Impossible here to fix? Sadly, I can’t say I was surprised to hear it was Gusanoz, our local Mexican restaurant (indeed, probably the only place locally I can call Mexican without putting quote marks around it). Gusanoz is no stranger to these pages. Indeed, since I started writing Offbeat Eats, including this review I will have written them up four times (a record!). And, indeed, I’m not sure the paint had even dried on Restaurant Impossible‘s renovations back in May before my readers, friends, coworkers, and acquaintances started asking me if I had been by and checked out the “New” Gusanoz. Well, in short, I hadn’t. I might have checked it out right away, but that time of year was busy (back to back trips to Austin and Chicago, indeed, the very day Gusanoz was getting its makeover I was eating Carnitas at Carnitas Don Pedro in Chicago). And then several other trips (in no particular order, San Antonio, Iceland, and Germany) came up, and I decided that, overall, it was best to give them some time to settle in to the new state of affairs and see if the Restaurant Impossible changes “stuck”. First, lets review a bit of Gusanoz’s history, which has had more than a few ups and downs. Gusanoz opened back in 2005 in the very small storefront that used to hold Grizzaffi’s Pizza. They quickly got known for two things: Mexican food that was actually good (with an outstanding Sunday brunch buffet), and long lines since they only had about half a dozen tables for seating. Well, word of mouth continued to work for them, and when the space next door (a former Weight Watchers clinic) became available, they expanded into the new space and finally had some real seating. For a while, everything was good… no longer long waits for tables, the food was great, and everything was basically good. Good enough that they decided to expand. Like many restaurants, this was the first of many business decisions turned out badly. The new location over in Vermont was an epic failure: it just didn’t have the crowd traffic it needed, the space was cavernous (so people arriving would see a giant, empty restaurant), and it split forces between restaurants. Not only did the new location drain financial resources, but it drained attention, and that’s when I started to see something that Gusanoz has since become known for throughout the area: bad service. The formerly excellent service quickly deteriorated into slow, inattentive, and often completely apathetic service, I think since the owners weren’t there often enough to keep things in shape. What happened over the next few years was a serious of attempts to reinvigorate the business and make up some lost revenue, and many of the actions here would be comic if it weren’t for that fact that the business (and owners) suffered so much as a result of the failures. Don’t get me wrong, some of the ideas were actually pretty good: they opened a burrito stand in Hanover that was surprisingly popular with Dartmouth students for takeout (surprising to me, since the Hanover location wasn’t really a full restaurant; there was no kitchen, and “fresh food” there meant “freshly microwaved”), but it ended up being, at best, a break-even proposition. And their attempt to expand their business by opening for breakfast was actually something I really enjoyed, with some really good authentic dishes (you can read my review of Gusanoz’s breakfast attempts here). But they never were able to draw crowds, even with my efforts at spreading the word, and Carol and I usually found ourselves being the only ones there. And then there were the bad decisions: the Gusanoz owners took over operation of the Hanover Ben and Jerry’s (which had 20+ years of success and consistent long lines), and managed to plow that place into the ground, eventually rebranding as “Carnival Ice Cream” before closing forever (as I write this, the building is still shuttered). And deciding to open a third Gusanoz in the Powerhouse Mall in a spot that was, I kid you not, a converted stairwell, for more microwaved burrito goodness (and $1 bags of popcorn, which I suspect were the bulk of their business). And there was even one truly bizarre venture: Revolutionary Burger, an attempt to duplicate the In-N-Out Burger experience by selling burgers out of the back of the Lebanon Gusanoz, with no advertising but word of mouth (read my review, foodwise, this was actually a complete success, but business-wise was another disaster). And even a few odd occurrences that weren’t even their fault as far as I could tell (I got the details second-hand, but apparently they had to shut down their popular karaoke night for insurance reasons). Apparently, after years of these sorts of side efforts, while almost completely ignoring day-to-day operations, the owners Nick and Maria (who I have met several times, and they are truly nice people) found themselves in desperate enough shape that a call to Restaurant Impossible was in order, and this year Gusanoz celebrated Cinco de Mayo by closing up shop so that Robert Irvine could remake the place. Before I get to far into the renovated restaurant, this is a good place to mention an important fact: through all the business ups and downs, and throughout the, quite frankly, dismal service issues of the last years, one thing remained reasonably consistent and good: the food quality itself. While not quite a good as the days of 2005 and 2006 when you could see Maria in the kitchen, at least the particular items I usually ordered (the always-good Carnitas and the enchilada plates), I never had food quality problems at Gusanos. And as I mentioned above, the short-lived breakfasts were actually really, really good. But service was always dismal. Long waits to get seated. Servers ignoring our table. Servers asking if you wanted more chips and salsa, who would whisk away your existing chips and never return. Lost drink orders. Empty glasses begging for refills. Staff that obviously felt that whomever they were texting was more important than the paying customers. And the inevitable argument over a bill including items not ordered, or ordered and not actually delivered. Hey, I’m used to the fact that Upper Valley places have a hard time getting good help (bad service is endemic around here), but Gusanoz was always able to stay near the top of my “worst service in the Upper Valley” lists (although never surpassing Mai Thai). And remake it they did. The restaurant space itself, which had slowly migrated over the years from “small Mexican restaurant” to “tired and worn tacky Pinata” was renovated heavily from a dark, tired space into a very bright, white, and colorful space (in the process, losing the irritating fake tree at the entrance that both Carol and I seemed to always hit our heads on, since it was at forehead level). Robert Irvine also came up with several new dishes, including a popular table-side guacamole, a lobster roll taco, and several other fancy dishes. Possibly just as important, the renovation came with new, higher prices, since it was apparent that one problem they had was not enough revenue to cover expenses. And then the episode of Restaurant Impossible aired a few months ago (you can now watch it online here), and I wouldn’t call the picture it painted of Gusanoz very complimentary (I’ve actually heard a lot of dissenting opinions on this, but that’s my take). The show pictured a disinterested staff, poor management, and (a surprise to me, since I’ve never had problems with the food quality there) some really disturbing kitchen practices. In particular, the show called out Gusanoz for a few things: (1) relying too much on pre-made food instead of fresh items, (2) poor leadership, and (3) staff that was more interested in things like texting than taking care of customers. The immediate reaction of the local population was at once a mixed bag (go look at other review sites, you can see things like “Absolutely ruined by Restaurant Impossible”). While a lot of other people have had the same issues as I did with Gusanoz, most everyone had liked the food, and wanted Gusanoz to succeed. People generally liked the physical renovations, and liked several of the new items, but many folks were upset that long-favored menu items were gone. And some people didn’t like the new lighting. So over the last few months, Gusanoz has settled into a “new normal”. The lighting is now subdued, bringing it much closer to the original. Many menu items, and the $5.99 lunch specials, have been brought back, the latter being a nice response to many complaints of the newer higher prices. And there are are few changes that I and others don’t like at all: the salsa bar is gone, for example. It was to this condition we found ourselves arriving at Gusanoz. We figured six months was a good amount of settling time, and a good time to check up on how things were going. Looking over the menu, we could see that it still had a page of “Chef Irvine Entrees” dishes, along with a page of “Gusanoz Classic Entrees”. Splitting the difference, Carol got the Pollo Mole off of the Chef Irvine menu, while I opted for an old favorite off of the Classic menu: the Chile Verde Burrito. I’ll cut to the chase here: the food is improved over my last pre-renovation visit. 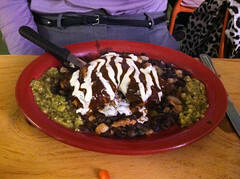 Carol’s Pollo Mole was moist, flavorful, and had a much richer mole sauce than the sauce they were previously using. My Chile Verde Burrito was also quite good: nice, tender, and flavorful chunk of pork with a nice green chile sauce rolled up into a burrito, I was pleased with my dish. However, the various steps and interventions that Restaurant Impossible did with the staff seem to be wearing off, with the staff slipping into old ways like a bad habit. It quickly became obvious that service is still sorely lacking at Gusanoz. Slow service. Missing drinks. Absent waiters. Missing items from orders. Come on folks, it’s only been six months since you had the lecture on how if you want to stay in business, you have to improve. It obviously didn’t take. Here’s a real hint: if one of your staff members was called out on national TV for being disinterested, talking on their cell phone, and ignoring the restaurant… six months later, I shouldn’t be seeing that exact same person, still making phone calls from the bar, going outside to talk to friends, and ignoring the bar orders they are supposed to be filling (mine included). And my complaint from previous visits that my waiter would come by, ask if we wanted more chips, and then disappear not to be seen until well after the entrees come from the kitchen? Yeah, we had that happen again. Ever have one of those moments where, despite a lot of hard work and effort, you look down and realize you are back exactly where you started? That’s where I feel Gusanoz is, with the only real lasting change being higher prices. While I really hate kicking Gusanoz while it’s down…. seriously, the service sucked. That’s the long and short of it. I like your food, even with the new menu. And I want you to succeed. But you aren’t going to get there the way things are going. Please, do something before I’m standing there looking at an empty storefront where Gusanoz used to be. Ok. I read your reveiw of Gusanozs. I have never been there but do go to the area for hospital visits. After seeing the show on tv we thought we would make a stop on our next trip. 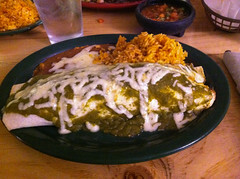 But after reading your review we are not quite sure except, you did say the chili verda burritos were good. So i guess what I need to know is if not Gusanozs for chili verda burritos then where . Most of the “Mexican Restaurants” don’t even know what you are talking about if you ask for a chili verda burrito. Of course I live 8 miles from the canadian border so I have learned to make it ( kind of) but would like to find a real, real Mexican restaurant some where around the middle part of the state. And since when is fish a mexican dish? Growing up in Southern Calif and going to real mexican restaurants, I never saw fish on the menu.